Have you ever had an idea for a card, but when you made it, it just didn't look quite right? Like it "needed" something else? Well, that happens to me all the time. So I thought I would show you a card I was working on this past week for a workshop make-n-take project and how I brought it up to where I was satisfied with it. First off, I wanted to make a card that showcased some of our DSP because of the August special. And because I was using the Well Worn Designer Series Paper, I could make the card look a little more masculine. I find that making cards for guys is much more difficult for me than making cards that are for women. Here is the first run at this card. It uses the Word Play stamp set and the Texture Jumbo Wheel. I also used the 1-3/8" square and 1-1/4" square punches, and the Blossom Bouquet Triple Layer Punch to make the "bows". The words were colored with markers (Soft Suede and Cajun Craze). It's not bad, but I thought it needed something more. 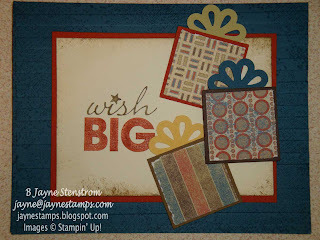 The next try was the same except that I ran the Not Quite Navy cardstock through the Big Shot with the new Stripes Textured Impressions Embossing Folder. That helped give it some more depth but I didn't like all of the blank space on the left. The Best Friends Forever stamp set was sitting on my desk (this is one that demonstrators got FREE at Convention this year!) and I thought, what if I added the leafy image from that stamp set in the upper left-hand corner? I inked it with Soft Suede and then stamped it off once before stamping on the Very Vanilla cardstock. I think it draws your eyes down to the "Wish Big" saying now. Now the card looked complete to me - and I must have made good choices because the ladies at the workshop all commented how much they loved it! So sometimes if your card seems a little "flat", try adding some dimension with a textured impressions folder, or thinking outside the box by adding an image to accentuate it. There is one caveat, however, and that is that sometimes "less is more". Sometimes it's best to just back away from the card and let it be. You can always add a little something to a card, but it's really hard to take something away once it's on there.